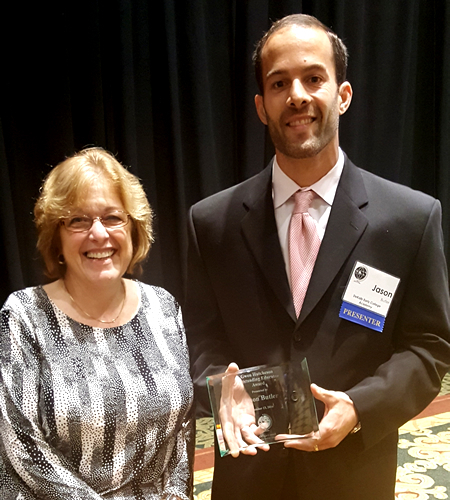 DeKalb Early College Academy teacher Mr. Jason Butler received the Gwen Hutchinson Outstanding Educator Award at the Georgia Council for the Social Studies annual conference. This award is given to an educator who has made an outstanding contribution to the teaching of social studies. Mr. Butler is a 2012 James Madison Fellow and the current Teacher of the Year at DECA. Through teaching innovation and leadership, Jason’s students achieved a 100% pass rate on the U.S. History End of Course assessment in 2011 and 2012. In 2015, 59% of his AP US History students scored a 4 or better on the AP Exam. Mr. Butler also volunteers his time to provide enrichment opportunities for students as they compete in National History Day, Mock Trial, and the Georgia Student Media Festival. Congratulations to all teachers representing DeKalb County School District! If you have any questions, contact Mrs. Kimberlynn Weston , K-12 Social Studies Coordinator (678.676.0144). Mr. Butler is pictured with his mother and lifelong educator, Mrs. Maxine Butler.